It's hard to believe that here we sit on January 10th 2016 and just yesterday was the first day I could get on the mountain. But the winter has been dreadfully warm and it was looking like it might never arrive but the season is actually open ... albeit with a limping start. This all sets the stage for a proper East Coast review of the Spliffs as the conditions are really representative of the average crap we ride in. No powder days or super wide groomers just icy, slushy, crud covered and crowded narrow runs. So how do the Spliffs handle these conditions? They destroy them! My review in one word? Awesome! Of all the boards in my quiver and the boards that I tried these have now moved to the top of my favorites list. They ride small and perform big meaning they embody the minimalistic feel we love in skiboards but have the edge hold and crud busting ability of a much larger weapon. While some skiboards are specialists like the RCs busting pow or the KTPs wanting the be driven hard the Spliffs will do what ever you want .... cruise slow, carve hard, slarve the crude, jump in the park, and rip through the ice. I did not find a condition or situation that I felt off or that they could not handle .... that's a first for me on skiboards. Every board seems to have a small gap in their performance envelop, I cannot find that with the Spliffs and I tried to find it riding everything except powder (but I rarely get deep pow so it's not a huge consideration for me). One of the things I noticed was how forgiving they are on body position. In this way they are very much like the Spruce 120s but there is one notable exception. Every board I tried (with the exception of the RCs) want you to lean in a bit and "ski" them when you are charging hard. You can do this if you want on the Spliffs but they don't require it. I loved that I could ride them completely upright or even a little in the backseat with no performance change. Conclusion: These are awesome East coast skiboards that are perfect for the conditions we in the East typically encounter. They are potentially a "Quiver of One" board. The are probably best suited for intermediate to advanced riders as I do not think I could have handled (or appreciated them) when I started in the sport. I rode these box stock straight from Greco. No base or edge adjustments. No detuning. I would not change them. Last edited by Wookie; 01-11-2016 at 09:19 AM. Reason: Corrected typo in the conclusion -- Thanks Gromit for catching it!! Nice review, Sir Wookie. Look forward to hearing more of your thoughts as you get more time on them. And glad to hear you all have finally located your missing Winter. Hi Wookie , Thanks for your review ... I agree with your observations concerning the Spliff .. 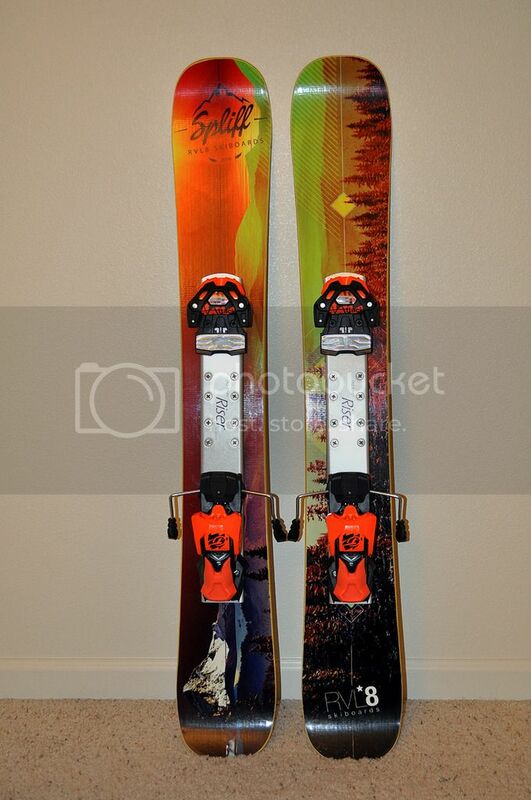 They are a real special board and my favorite resort skiboard by a wide margin .. In addition in deep pow they also work great for me ( although I do ride them with a 4 cm set back on my receptor bindings ) , plenty of float , the equal of the Condor series for me in pow and yet a nicer carve in firm snow .. I agree that they ride small in firm snow feeling narrower then they are and ride big in soft snow and crud , really a unique combination of qualities. , I am six foot tall and weigh about 200 lbs , so not a tiny guy either ... and for me out west in the best pow conditions we have had in years .. they are my quiver of one resort board also ! Ditto. One quiver dream board. Great review Wookie. Sums up my feelings about the Spliffs. Can I have your Cities? Joking aside (as you would never part with them), I run Revolts, and I know they were your board-of-choice. I'm a bit smaller, at 6'1" 165ish, and ride in New England exclusively; would it be your suggestion to pick up a pair? Does the performance envelope encompass that much more than the traditionally cambered, slightly smaller 105cm Revolt? I would suggest you at least give them a try. It may not be that their performance envelope is wider but rather that the bad habits are smaller. What I noticed is the rocker makes them feel smaller on the flat and initiating turns but when you lay them on edge in a basic turn or hard carve the full length is there so that longer edge is there when you need it and not there when you don't. It seems to eliminate the "hooking" or "catching an edge" that some riders complain about with full cambered boards and try to solve by detuning the tips/tails of traditional cambered boards. Relative to the Revolts you get the benefits you would expect from that added size of the Spliff but you don't feel like you have to work harder or carry more board. They feel smaller than they are. To contrast against this, my Condors are similar length and just a tad wider and I notice every bit of it. The Condors feel heavy and like I have to work to get them from edge to edge when you compare them to a board like the Revolts ridden in bounds at an East Coast resort. Perfect; thank you very much. Making it down to Elk Jams is unlikely (but haven't ruled it out), so perhaps I'll get to see them in action. What you wrote is 100% what I was thinking after hearing everyone else's reviews, but I wanted to hear it from another Ice Coaster who lived on Revolts for a while. They sound very tempting. Hey Wookie, what bindings are you using on your Spliffs ? I'm riding non rockered Condors with 10+ year old Line FF PRO bindings and am thinking of getting the Spliffs and will probably get new bindings as well. I am using Spruce Pro Sport Release Bindings with the SL100s. No breaks, just leashes. I thought about riding these with non-release but felt they were a little big for non-release (also I am lazy and it's easier to step in to release bindings). I think they perform well with the basic Spruce Bindings. I just recently started using release again, not because I'm worried about safety. It's because my bad lower back has gotten worse (a lot less bending over with releasers), and I'm getting old and lazy too. I met jjue and his son up at Sugar Bowl this morning for some powder riding on the Spliffs. They did surprisingly well in the pow. Last time I had them in powder at Northstar I face planted right off the bat. I think the snow was much wetter, heavier, and choppier that day. Today it was silky soft. I was able to surf the Spliffs with minimal effort. I did lean back on the tails quite a bit. I think that helped immensely. Oh, check out my orange Attack 13s. They match the Spliffs, RCs, and XLs nicely. They do look sharp with the orange bindings! I had my Spliffs out last Monday for a first ride in PA. 20 degree day after a daily 64 degree rain filled day. All machine groomed and an empty mountain meant hardly anyone to disturb the east coast powder. They were unbelievable stable and held an edge in every turn. I did not necessarily try to carve too much because of the lack of wide runs open. More to come but by the end of the day, I almost forgot that it turned icy. I ride attack13s with spruce. The pow riding ability of the Spliffs is really a fringe consideration for me as a deep pow day, where I ride, is a bit like seeing a Yeti riding a Unicorn while wearing a party hat (aka Mythical). Honestly if I lived in an area, say Utah, where dry pow is more then norm than the exception I would have a pair big of long wide powder planks and likely move away from skiboards but I don't live there and the Spliffs, even with my large frame driving them, seem to be able to handle 99% of what the Mid Atlantic East Coast can throw at them. Take last night for an example, I was able to bug out of work early to get in some midweek night riding at our small local hill. The hill has received zero natural snow and snow making conditions have been less than perfect with rain and warm temps mixed in to the few days cold enough to turn on the guns. This creates a mountain the looks good from far but is far from good ... icy, thin coverage, crud, ruts, narrow trails. I turned the Spliffs loose in these conditions and they slayed it. Good edge grip when I wanted it but an easy soft edge slarve when I need a softer edge. Even in the hardest hard pack they carve well laying down deep parallel trenches in my wake. So far these boards have moved to the top of my quiver. They seem to handle great and run fast. The next test will be the longer runs at Elk Jam and keeping up with Macrophotog and is young padawan Gator. Then the Spliffs head West in Feb/March for field testing in Colorado. If they pass both of those tests look for at least a pair of Revolts and a pair of 120s to hit the classifieds section of the forum.